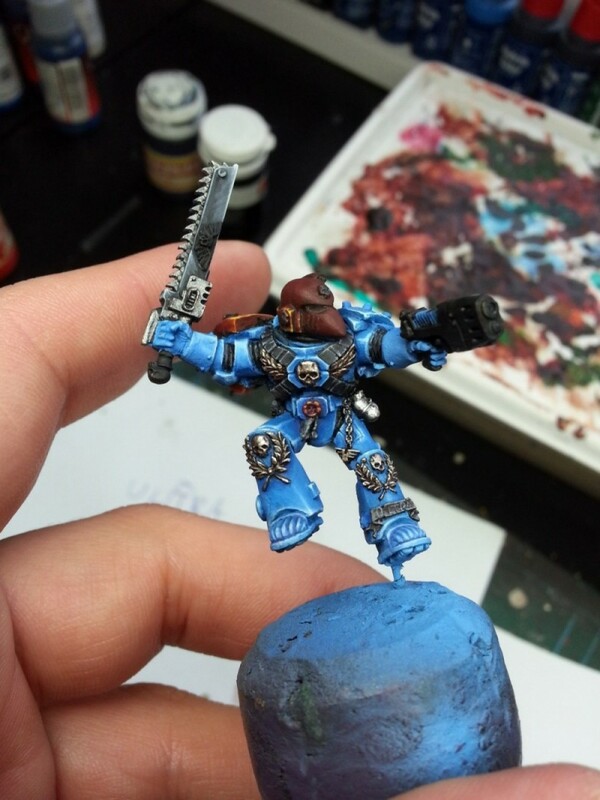 It have been a very stressful time lately and having trouble finding time to paint on the Sternguard Space marine that will be a part of Outpost 142. It have a long way left before it will be done, but hey! It’s a start! I primed the Sternguard in Chaos black (GW) and Grey surface primer (MIG) without his jump pack. 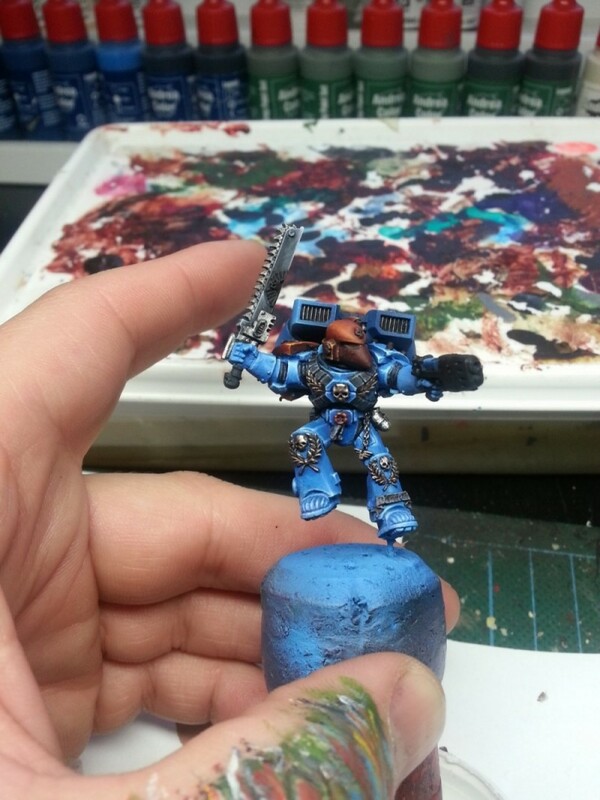 Then I took a darkblue color in my airbrush and cover the entire Sternguard. This would be my shadows. 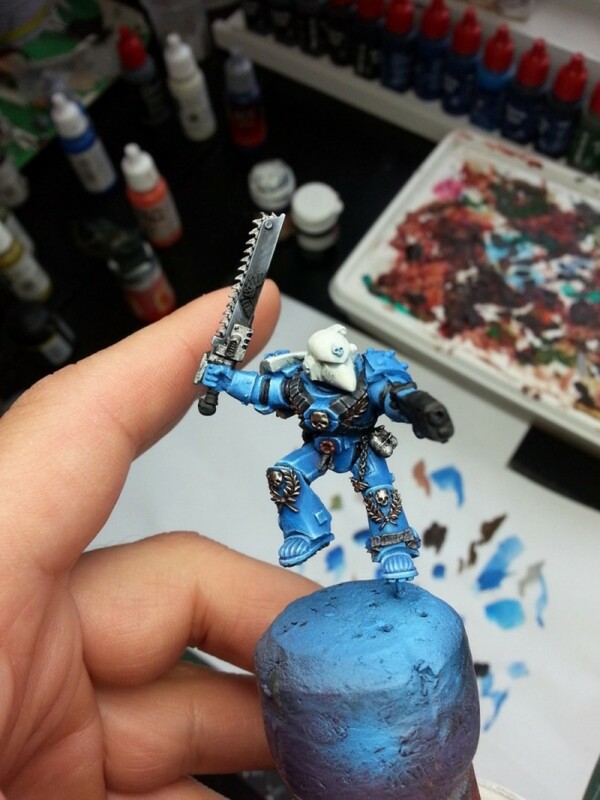 I then mixed the darkblue with a midblue color and painted the marine with his place on the base in mind, again using an airbrush. I added some white to the colors and did another step, keeping the highlights smaller and smaller. Now I had my base shadow, midtone and the first highlight. From now on I paint with a brush. 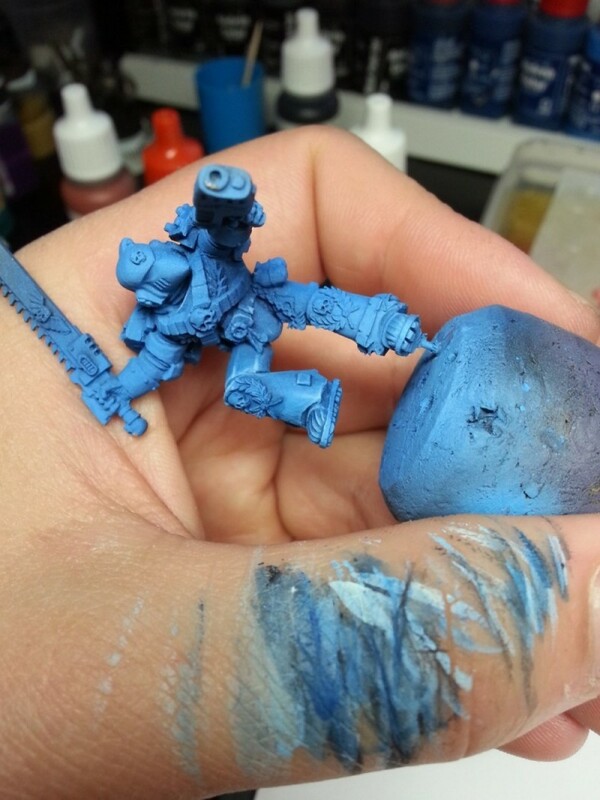 I started to outline each armourplate that I would work with using a very lightblue color. From that point I worked with glazes and tried to slowly build the color gradient from blue to pure white. The golden parts on the armour was painted using a mix of black and Tinny Tin (VGC). I then mixed Tinny Tin with Gold (VMA) and then the final higlight gets a spot of pure Silver (VMA). Later on I will add some inks to the golden, but I’ll take that as one of the last steps. At first I painted the shoulder rim and helmet white, but that didn’t do it for me so instead I changed it to read (or still working on it) and that was much better. With white helmet and shoulder rim. With red shoulder rim and the start of the red helmet. Next picture was taken a few minutess later, showing some more progress on the helmet. This will be all for now. This guy will now rest for a while and in the meantime I’ll finish a few other miniatures which are just waiting for the final touches.